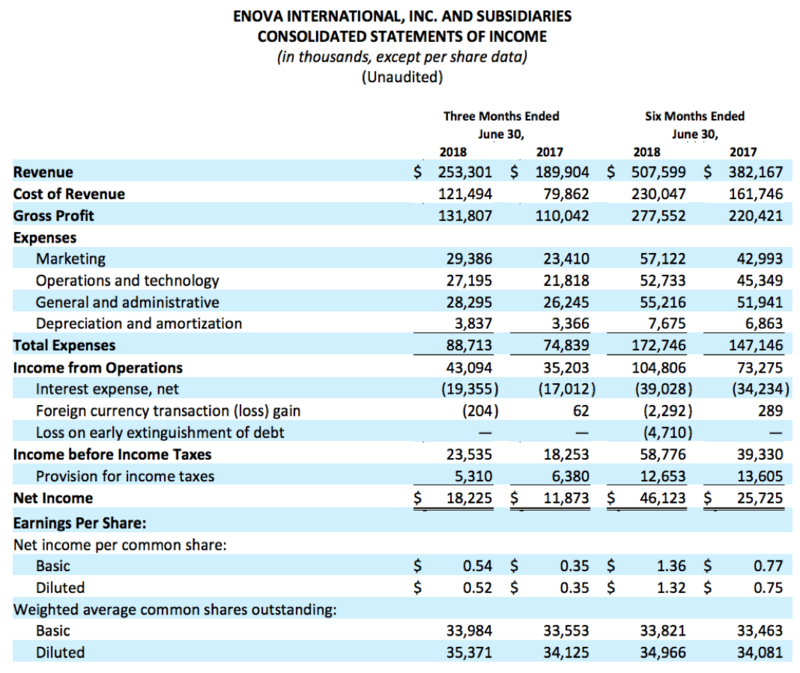 Enova Reports Second Quarter 2018 Results - Enova International, Inc.
CHICAGO (July 26, 2018) — Enova International (NYSE: ENVA), a leading financial technology company offering consumer and small business loans and financing, today announced financial results for the quarter ended June 30, 2018. • Total revenue of $253 million in the second quarter of 2018 increased 33% from $190 million in the second quarter of 2017. • Gross profit margin was 52.0% in the second quarter of 2018 compared to 57.9% in the second quarter of 2017. • Net income was $18 million, or $0.52 per diluted share, in the second quarter of 2018 compared to net income of $12 million, or $0.35 per diluted share, in the second quarter of 2017. • Second quarter 2018 adjusted EBITDA of $50 million, a non-GAAP measure, increased from $42 million in the second quarter of 2017. 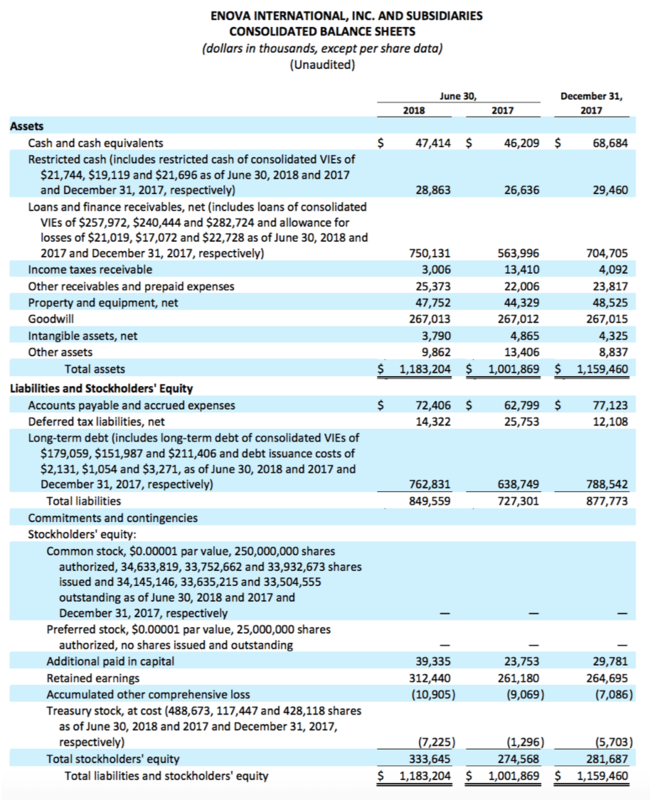 • Adjusted earnings of $21 million, or $0.59 per diluted share, a non-GAAP measure, in the second quarter of 2018 increased from adjusted earnings of $14 million, or $0.41 per diluted share, in the second quarter of 2017. Enova ended the second quarter of 2018 with unrestricted cash and cash equivalents of $47 million. As of June 30, 2018, the company had total debt outstanding of $763 million, which included $179 million outstanding under Enova’s $295 million securitization facilities. 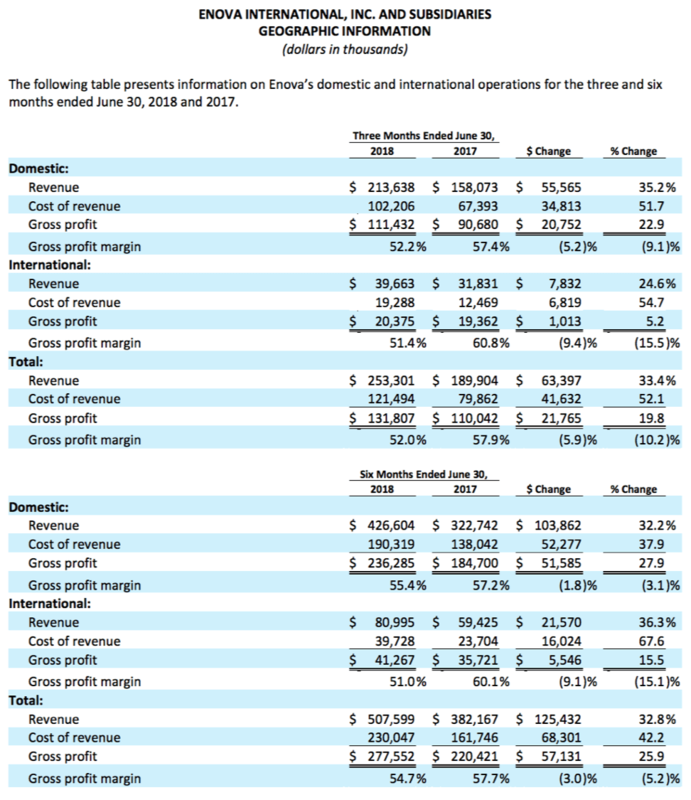 During the second quarter, Enova generated $143 million of cash flow from operations. On July 23, the Company added a new 3-year, $150 million securitization facility to support growth of the NetCredit business. The new facility increases total NetCredit securitization capacity to $445 million and lowers the cost of financing. For the third quarter of 2018, Enova expects total revenue of $260 million to $275 million, GAAP results of $0.30 diluted earnings per share to $0.52 diluted earnings per share, adjusted EBITDA of $40 million to $50 million, and adjusted earnings per share of $0.37 to $0.58. For the full year 2018, Enova expects total revenue of $1.035 billion to $1.075 billion, GAAP diluted earnings per share of $1.78 to $2.22, adjusted EBITDA of $195 million to $215 million, and adjusted earnings per share of $2.19 to $2.63. 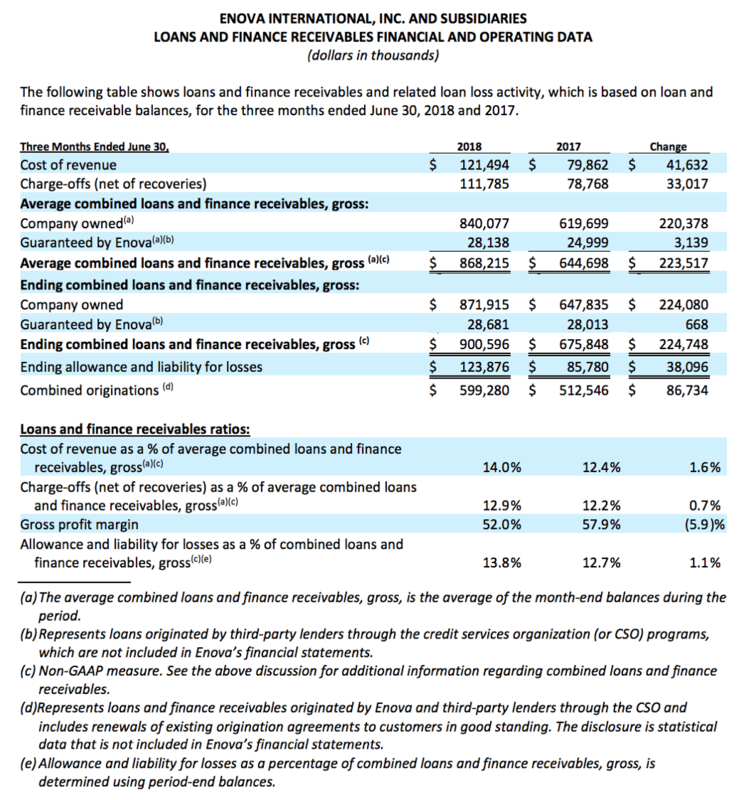 For information regarding the non-GAAP financial measures discussed in this release, please see “NonGAAP Financial Measures” and “Reconciliation of GAAP to Non-GAAP Financial Measures” below. Enova will host a conference call to discuss its results at 4 p.m. Central Time / 5 p.m. Eastern Time today, Thursday, July 26th. The live webcast of the call can be accessed at the Enova Investor Relations website at http://ir.enova.com, along with the company’s earnings press release and supplemental financial information. The U.S. dial-in for the call is 1-855-560-2575 (1-412-542-4161 for non-U.S. callers). Please ask to be joined to the Enova International call. A replay of the conference call will be available until August 2, 2018, at 10:59 p.m. Central Time / 11:59 p.m. Eastern Time, while an archived version of the webcast will be available on the Enova Investor Relations website for 90 days. The U.S. dial-in for the conference call replay is 1-877-344-7529 (1-412-317-0088). The replay access code is 10121788. 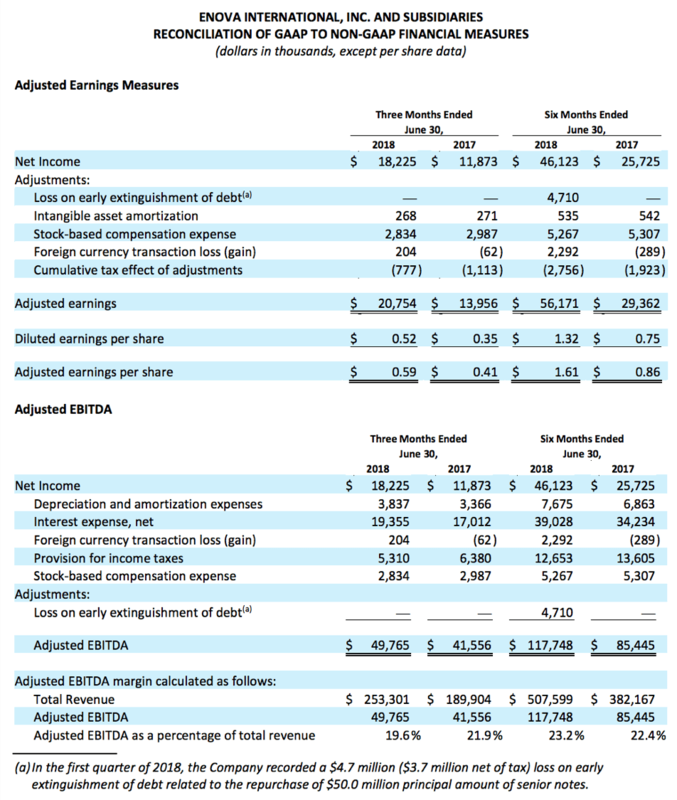 Adjusted EBITDA is a non-GAAP measure that Enova defines as earnings excluding depreciation, amortization, interest, foreign currency transaction gains or losses, taxes, stock-based compensation, loss on early extinguishment of debt and acquisition related costs, and Adjusted EBITDA margin is a nonGAAP measure that Enova defines as Adjusted EBITDA as a percentage of total revenue. Management believes Adjusted EBITDA and Adjusted EBITDA margin are used by investors to analyze operating performance and evaluate Enova’s ability to incur and service debt and Enova’s capacity for making capital expenditures. Adjusted EBITDA and Adjusted EBITDA margin are also useful to investors to help assess Enova’s estimated enterprise value. 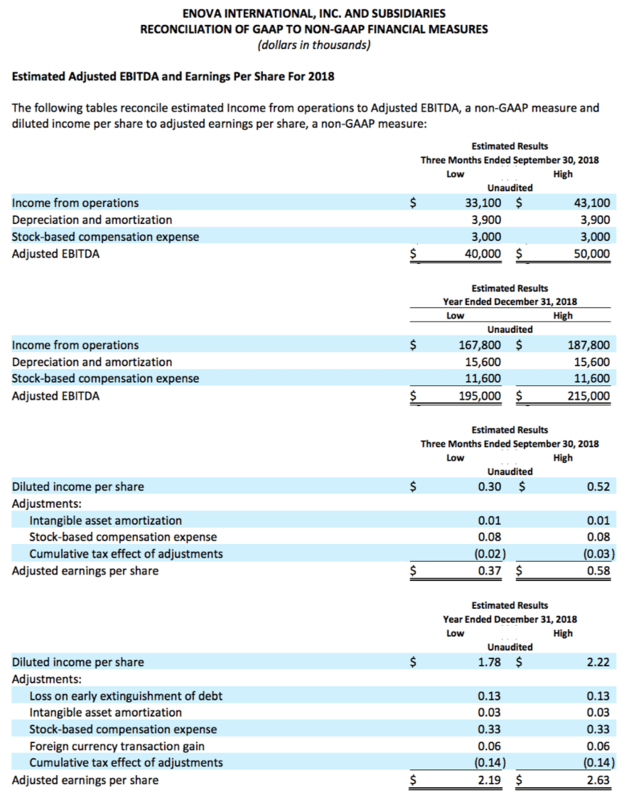 The computation of Adjusted EBITDA and Adjusted EBITDA margin as presented below may differ from the computation of similarly-titled measures provided by other companies.